ST. PETERSBURG, FLA. -- The Caribbean Community Climate Change Centre (CCCCC) awarded YSI Integrated Systems and Services (a division of Xylem Inc.) a contract for five marine monitoring buoys that will collect high-quality data for researchers studying climate change in the Caribbean Sea, including the waters of Barbados, Belize, The Dominican Republic and Trinidad & Tobago. This coastal buoy supports a full array of water quality sensors, data acquisition systems, and meteorological sensors. Its hull and structure are rugged enough to withstand significant wind and wave activity in ocean applications in less than 75 meters of water depth. “The Caribbean is a unique part of the world. Our waters are the ‘bread basket’ for the region, and we must be diligent in protecting and sustaining them. We are very excited to build our education and research infrastructure with the addition of this important technology project for addressing the impacts of climate change on the Caribbean ecosystem,” says Dr. Kenrick Leslie, CCCCC Executive Director. The customized YSI EMM 2000 buoys measure, record, and transmit in real-time meteorological and water quality data as the key components of a Coral Reef Early Warning System (CREWS). Coral reefs play an extremely important role in the Caribbean economy for tourism as well as food production and food security. The regions’ unique reefs have been impacted by rising sea temperatures and pollution. Long-term monitoring of environmental conditions in the Caribbean will help researchers track the health of the reefs, among the oldest and most diverse ecosystems on the planet, and mirrors similar systems already installed at key reef sites in the Atlantic and Pacific Oceans. Data will allow development of climate models and ecological forecasting in coral reef ecosystems. The CREWS buoy system will contain EXO2 water quality sondes; SonTek Argonaut XR current Doppler profiler; meteorological sensors and cellular or GOES satellite telemetry. The stations will take long-term measurements of sea temperature, depth, salinity, algae, turbidity, dissolved organic matter, as well as wave velocity and weather data. 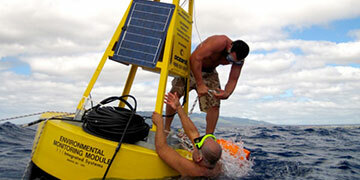 Data acquisition systems on the buoys will gather and transmit the data. Solar panels will power the entire system. Caribbean researchers and scientists from national and regional universities, government coastal marine research departments and non-governmental organizations are expected to use and benefit from the data to be generated by the CREWS stations. The CREWS system will be expandable with additional sensors and parameters—such as CO2 and underwater PAR—to accommodate visiting researchers who later join the collaborative project. The CCCCC will work with the U.S. National Oceanographic and Atmospheric Administration (NOAA). The CREWS system, originally developed by NOAA, has been successfully used in modelling and alerts of coral bleaching conditions in the Florida Keys and the Great Barrier Reef, and it is NOAA’s intent to expand this alerting capability to other coral reef areas, and to better refine and enhance its alerting capabilities beyond coral bleaching. The development of the CREWS coral bleaching and other coral reef-related alert and modelling expert systems are therefore of necessity dependent upon the expertise of problem domain experts, such as those who study coral bleaching, coral reef growth, etc. The CREWS project is funded by the European Union and the Global Climate Change Alliance in the amount of US $617,000.00 \ € 465000.00 and is part of a wider €8,000,000 climate change project “The Global Climate Change Alliance Caribbean Support Project” being implemented by the Caribbean Community Climate Change Centre. NOAA’s Coral Reef Conservation Program and the Atlantic Oceanographic and Meteorological Laboratory in Miami has also committed funds and resources for data management and coral reef support for the project. Thank you to Jonathan Fajans, President of C-ARMS, for providing the photos used in this application paper. The contents of this publication are the sole responsibility of Xylem Inc. and can in no way be taken to reflect the views of the European Union.